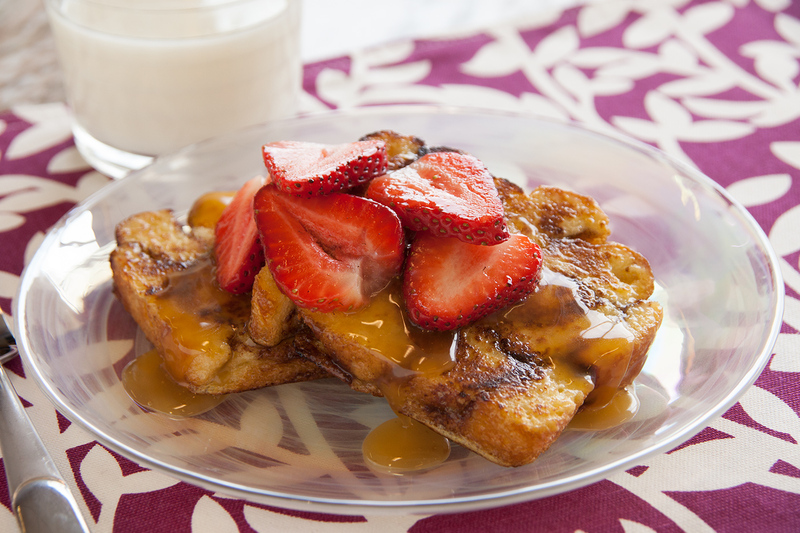 This would make the perfect breakfast in bed for Mom! Lay cinnamon rolls in a sprayed 8 1/2 x 4 1/2-inch sprayed bread pan and push them together to remove any air pockets. Cover with sprayed plastic wrap and let rise until double in size. Remove wrap and bake at 350 degrees F 20-25 minutes. Remove from pan to cool before slicing. Combine eggs and milk then beat well. Dip bread slices in egg mixture and cook in a sprayed electric frying pan heated to 350 degrees. Combine buttermilk, sugar, butter, corn syrup and baking soda in a 4-quart saucepan. Bring mixture to a boil and reduce heat to medium-low (make sure it continues boiling). Cook, stirring continually for 8-12 minutes or until the syrup reaches a rich golden brown color. Remove from heat and stir in vanilla. hOW MANY EGGS TO YOU NEED FOR THIS RECIPE? Thank you for noticing this! We have added that to the recipe.